Teachers touch the hearts and mind's of our children in so many ways. Show your special teacher appreciation and support with our "Teacher's Touch" photo frames. Provide the teacher's name below. Inscribed Engraved with: "A Teacher Takes a Hand, Opens a Mind and Touches a Heart." 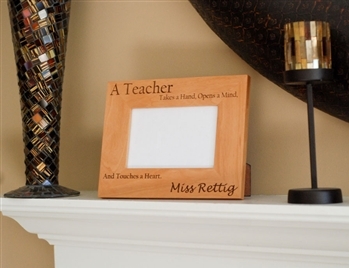 This 4" x 6" lovely wood frame is sure to leave a lasting impression on your teacher. Top quality hardwood wood frame with easel mount for table top display. Frame holds a 4" X 6" photo. Overall dimension are 7" X 9". © Copyright 2015 FirePoint Creations. All Rights Reserved. Built with Volusion.